When my brother was 8 years old, he suffered from warts on his feet. My mother had taken him to a doctor who tried to cure his condition using various techniques and ointments. With each treatment, his feet would clear up…but it was only a matter of time before the warts would return, sometimes worse than before. After exhausting what seemed to be every option, my mom was given the name of a woman who healed people’s ailments through prayer. This woman lived out in the country, nearby our home in Opelousas, Louisiana. Out of frustration for my brother’s condition, and with nothing to loose, she took him to see this healer. When they arrived, he was taken into a private candle-lit room. There, my brother laid on a table while a series of prayers were said over his feet. The very next day, the warts began to turn light black. A week later, they were completely gone…and never came back. There is a feeling of mystery in the story when my mother tells it…like it was some sort of miracle. Both my mother and brother describe the awe they felt when the warts left his feet and never returned. It wasn’t until years later, when reading more deeply about Cajun history, that I came across the french term traiteur. A traiteur, or ‘treater’ in English, is a community healer. Traiteurs heal a variety of ailments through repeating specific french prayers that have been passed down for centuries. The treatments from a traiteur are a common and valuable form of healing in many rural Cajun communities. When I landed in Louisiana this spring, I sought to speak with a traiteur because I wanted to learn more. This is how I came to meet Mrs. Judy Gaspard of Forked Island, Louisiana. Judy Gaspard is a 5th generation traiteur. Traiteurs are seen by some as faith healers, people who channel the energy of God. Judy explains, “it is not us that does the treating…we’re just the go-between…God does the healing.” Most traiteurs see their work as a gift from God and do not accept payment for their services. In the past, they would also not accept a thank you, in fear the treatment would not work. 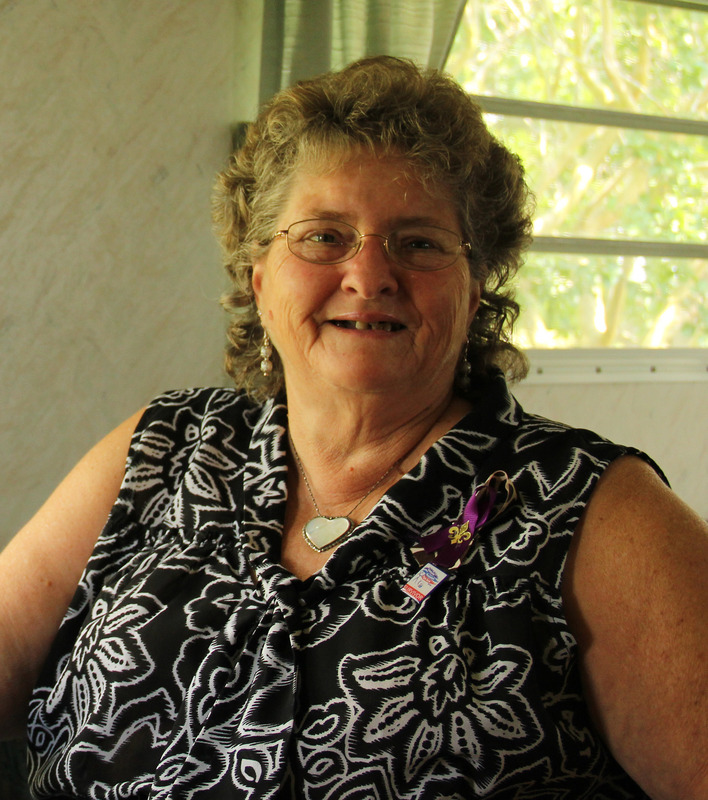 * This past April I had a chance to sit with Judy and ask her some questions about her role as a treater. How long have you been a practicing traiteur? I’ve been doing this for about 35-36 years. I got it from my dad. I’m the 5th generation that treats. My dad, grandpa, great grandpa, and great great grandpa were all traiteurs. Is there a particular story around how you were chosen to carry on this practice/tradition of healing? A man has to give over his treatments to a younger woman and a woman has to give over her treatments to a younger man…unless you are ready to stop treating, then you can give it to anyone. We were 6 children, 3 boys and 3 girls. One day my dad came to me and wanted to ask me a question. I immediately thought, ‘O Lord, what did I do…?’. (chuckles) He said “I’d like you to take over my treating…I’m not going to stop treating but I can hand it down to a younger woman.” I said, ‘Daddy, why me?’ He told me out of all his children he could see it in me. He saw how I liked to help people. It was true…I was always trying to help help somebody. Today too…if I can help anybody, I’m going to do it. And that’s how it got started. How long does it take for the treatments to start working? (If it’s a phone meeting), some people tell me right after they hang up. They say within 5 minutes, the sunstroke is gone…the hurting is gone…the earaches are gone…the toothaches, gone. Some of them will say it takes about 5-10 minutes. I also treat for warts and a lot of them will fall off right away and other times, it’ll take 2-3 days. It varies. I go by what people tell me. Can you treat animals, too? Yes, a traiteur can treat animals. My dad has saved race horses. My husband’s uncle, Mr. Orville Ryder, raised race horses–and one day a horse was racing and it fell. The people there told him to shoot the horse, to put it down…told him the horse will never race again. My husband overheard and said, ‘No, don’t kill your horse. Call my father-in-law.’ So he called my dad and my dad went out there and treated that horse. It was within an hour of treating it, that the horse was up and around. And he continued on to win a lot of races. Another thing…you can also treat for bad weather, not just people and animals. If you hear thunder and lightening in the distance…before it reaches your home, you can say the prayer for that treatment. And you’ll see how the storm rolls further and further away. My little grandson used to call me everytime the weather turned bad. He’d say ‘Maw maw, can you treat the bad weather please?’…he’d call me everytime. How often do you get people seeking your prayers? Sometimes during the day I’ll get 4 or 5 people calling…and at night, too…they‘ll call. Occasionally people will call me the next morning saying that their grandbaby cried all night long…but they didn’t want to call and wake me up. I tell the people that I can go back to sleep. Don’t let someone suffer if we can help them. Call me. I don’t care if it’s one o’clock in the morning….don’t let this child or adult suffer if there is any hope that we can help them. When, and to whom, will you choose to pass on these healing prayers? I will feel it. I think whenever I find the right person, I’m gonna feel it. I’m not going to give it to anybody until I find that this person is going to do good with it. These prayers are part of an oral tradition that has withstood centuries. Without tradition, these prayers would have died…and without faith, perhaps they never would worked in the first place. I’m curious to hear the stories of others who have been healed by a traiteur. Do you have any to share? This entry was posted in History, Uncategorized by cajunstories. Bookmark the permalink. Hi Tammy, your mom is wonderful. She helped take care of my great grandfather before he passed. It was a pleasure to talk with her. Hi Tammy. This is a wonderful interview and your mom is indeed a special lady. I would like to contact her. Is there any way that I might get in touch with her? I can send you my email address and/or telephone number if you would like to communicate personally regarding this. Thank you. My husband has rheumatoid arthritis, I would like Mrs. Judy Gaspard to treat him. Tammy, is there a number so that I can call her for friends??? Tammy, I would like to get your Mom’s phone number. I am having bad pain in my upper stomach. Been threw all kind of test & the Doctors keep saying the test shows normal. My grandmother used to be a greater, but she past away many years ago. I can’t find a treater here on the bayou. Would like to see if your Mom could treat me over the phone. Thank you, my name is Phyllis Melancon. I would love to contact your Mom for healing of shingles pain but have not been able to find a telephone number for her. Can you tell me how I can reach her? I would like to call your mom and see if see could help me with my arthritis. I am in so much pain. I was raised believing in prayer for pain and still do. I would really appreciate if you could put me in contact with her. God bless you. Hi Tammy, would it be possible to get your mom’s phone #? I live in Virginia, but my mom lives in Crowley which isn’t too for from your mom if she still lives in Forked Island. She has cancer so I have be searching for a traiteur for her, which isn’t easy from so far away. If she is able to help, I know my dad or sister could take my mom to meet your mom. We would be very grateful for her help! I’m in need of a traiteur. My traiteur passed away several years ago. My # is 337-257-7287. My name is Alicia leblanc. I would love to be able to get in touch with your Mom. My two year old daughter has very bad eczema and we can’t seem to find a way to get it under control. We have brought her to three different doctors and she still won’t clear up. She is constantly complaining that her “skin hurts” and it keeps her up at night as well. I would really love to have your mom’s phone number. A very dear friend has a child with warts all over her hands and the doctor has been unable to do anything about it. Could you please send me some kind of contact information. We would be willing to drive there as well. Tammy, I know you have been blasted with tons of emails an request, I too am looking for information on how to connect with your mother, I know this article was a couple years ago, so I hope this email finds you both in good health. I hope to hear from u soon. God be with you. How do I get in touch with her? I would like a telephone # for my friend to be treated via telephone. She is in severe hip; back and knee pain–80 yrs. old. Doesn’t leave her home because of pain. I would so much love to be treated. I fully believe God uses healers. I am diabetic and have chronic pain. I would just live to have a chance to be healed and have a normal pain free life. How can your mom be contacted? Tammy, I have been trying to get a phone number for your Mom with no success. I have 2 children I would like her to treat for 2 different things. You can email me at Gann2001@aol.com or my cel number is 337-884-9856. Work is 337-433-0234. I would love to ride out to her place and have her help my kids. My son works 21 on and 7 off . We would work around his time in. Thank you, Debbie Nutt Lake Charles, La. Hi Debbie, Mrs. Judy has since passed away. Much care to you. Hi Ann, Mrs. Judy has since passed away. Sending well wishes to you. Enjoyed reading about this lovely lady very much and also enjoyed the video. I think it is amazing to have the abilities to help others. I would like to telephone Mrs. Gaspard for healing. What is the best way for me to contact her? Please let me know. Thank you. I am getting in touch with Mrs. Gaspard to see the best way to navigate folks interested in her healing. Please send along your email and we’ll go from there. Best to you. I would like to contact Mrs. Gaspard for a healing for shingles pain. I would like to know how to contact Mrs Gaspard as I would like to be treated for shingles pain. Is there a way to get in touch with Mrs. Gaspard via email or phone? Thank you. I would like to contact her as well. Did you ever find that information? If so, can you let me know? I would like to contact Mrs Gaspard also. Really need some medical help. Hi Virginia, Mrs. Judy has been sick for quite some time now and is not doing healing work at present. Wishing you well. I am sending healthy blessings, positive energy and prayers to Ms. Judy. Yes, I am interested in how to get in touch with her. Yes I am in need of a traiteur and I live in Kaplan Louisiana! I know many people close to Mrs. Judy Gaspard who have recommended her to me! I would love to get in contact with Mrs. Judy! Hi Anna, Mrs. Judy has passed away–perhaps you have heard by now. All the best to you. While I have not been treated by this lady I did contact another traiteur. I had excruciating pain in both feet that left me largely bedridden. It was found I had Morton’s neuromas in both feet. For over a year I had multiple different treatments that failed. I was stuck with taking pain meds. I had heard about traiteurs and decided to call one. By the time I got off the phone I was no longer screaming in pain. I can now let sheets and other things touch my feet. I have worked in the medical field for over 30 years. I cannot explain what has happened but I know something special has. I still feel the abnormalities in my feet and have been able to cut pain meds down to almost nothing. I would love to know how to contact ms. Judy as I am a firm believer now and I would like to have a backup traiteur. Bren, oh my goodness. I have the same issue with both of my feet. I totally know your feelings. So I was wondering if you could give me information on the person you got help from. Or lead me in the direction of another. I know you posted this a couple of years ago. Hope u get my message an god be with you always. I would like to have the name of the one who helped u as I am having problem with my feet. They are getting numb & hurt. My daughter has been suffering with warts and I have been searching for a cajun healer is there any possible way to get a phone session? We would be so grateful. I would like to contact Mrs Bergeron to treat me for shingles pain. Do you have a contact number? Hello, my name is Shawn Guidry and as a small child my grandmother convinced my mother to bring me to a faith healer to rid my body of warts. I remember the healer praying over my warts in a dark-lit room with only a few candles lit. Around two months after going to the healer my warts were gone…..and did not reappear until recently…while at my grandmother’s house last month she randomly brought up the subject and informed me that the healer had passed away—right when I began having more warts on my body. I would have liked to thank the woman before she passed away but I am glad she is at peace. This memory will remain intact for as long as I live and I hope many others will have faith. I am a Holistic Practitioner for the past 10 years. I am of Cajun decent. My Mama recently told me last month that my Grandpaw was a Traiteur. Even though he did not ask me to carry on his legacy, I feel that this is why I have chosen my profession. I was in the corporate world 25 years, lost respect for it, and told my husband that I felt that God made me a nurturer. I would love to contact Mrs. Gaspard to see how I can enhance my skills as a Traiteur to pass on to my clients. Thank you and Healthy Blessings…. I find this very fascinating as I was raised in Louisiana and had a traiteur rid me of warts when I was a teenager. I have warts on my feet so many that it hurts just to walk can you tell me how to contact mrs judy please! For as long as I can remember my grandmother has been practicing the gift of the traiteur. Just recently she has passed on her gift to me. I am a 33 yr old male and she told me that she had to pass it on to a male and that she believed, as others have told me in the past, that I have a natural gift of healing. It has been a very humbling and amazing experience learning these special prayers and traditions of my family and culture. Your article has helped me to learn even more about this gift. I am very proud to help carry on this practice. Is there a way that I can contact Ms. Judy? Ms. Judy is my mother in law and absolutely a wonderful woman. I am a nurse and suffer from severe headache that no medicine helps, but one phone call to her makes it go away. If I am near her and get her to pray over me I get the most relaxing and tingling sensation. She is wonderful. Can you please let me know a way to get in touch with her? Hello Heather. I would love to contact her to get some info about the prayers, etc. since I am a Holistic Practitioner and do energy work as well. If you could share an email address or whatever way she feels comfortable, that would be great. Is there anyway that she can help my headaches. I get them often and nothing seems to help. Can I please get Ms Judy’s phone number? Heather, I would like to contact Mrs Judy Gaspard and wondered if you could give me a phone number for her. Appreciate your help. Thanks. I would love to contact her. Im originally from Kaplan but now live in Texas. Im a firm believer in what she does. My email address is Melstanley5@yahoo.com. My father has been treating sunstroke for over 53 years. I am guessing that he will pass this gift on to my sister, since she is such a caring and giving person. Hopefully she will keep this family tradition alive. I am trying to reach Judy for myself and a friend, Can you you help us reach her…. Can u pls help me for curing …. As a child growing up in Golden Meadow, Lower Lafourche Parish, my mom would always bring me to a traiteur for migraine headaches, fever, etc. He was of Sabine Indian descent, spoke french, and always had a wonderful, calming spirit about him. To this very day, my experiences with this holy man always lives within my heart. I have moved away from the bayou, and now live in the Baton Rouge area, and would love to find out if there are any traiteurs living around our area. Finding this article makes me hopeful that the tradition of faith healers lives on. I would love to get in touch with. Ms. Gaspard. I am from South Louisiana. I am currently suffering with body pain, neck and back with fatigue. I would Love Ms. Gaspard phone #, my son has been having a huge wart on his foot that keeps coming back and would like her help. My grandmother was a traiteur but passed away a few Years ago. I am desperate. Please tell me how to reach this gifted lady. Hi Bernell, Mrs. Judy has since passed away. Much care to you. My mom is interested in finding a treaters for shingles, can you help her. My name is Virginia Jaques 3379401263. Please please Ms Judy call me or send me your number! I am in excruciating pain in my back right leg groin . I have spinal stenosis two more bulging discs scoliosis top and bottom of spine and damaged sciatica nerve which is in constant pain like a tooth ache in my leg from back to hip to knee to ankle. I can’t take it anymore. Please help me I used to go to mr Sostane Lemelle but he died last year in August 2014. I have desperately been trying to get ms judy’s telwphone number but i just cant seem to get it! DoeS anyone please in the name of jesus know how to contact her . I used to go to Sostane Lemelle on Hwy 31 in Opelousas but he passed over August 2014. Please someone if you know ms Judys telephone number send to me either by email ginnyjaques@icloud.com or text or call @ my cell 337-940-1263 . My name is Virginia Lee Jaques. Please i need help . Thank you. How do i get in touch with judy gaspard. Does anyone know a phone number or an address? Hi there, Mrs. Judy has been sick for quite some time now so she is not doing her healing work at present. Wishing you well. Thanks. Hi i am in need of a traiteur. I live in Broussard. Name Jarrod Segura. please email me at jarrodseth@hotmail.com and i will provide phone number. Thanks. Hi Jarrod, Mrs. Judy has been very sick for quite some time…so she is not practicing healing right now. Wishing you well. Is she still ill? I am wanting to be a traiteur. I’ve asked a man here in town, but he sad I have to know the French language and I do not know it. But I’m willing to learn what I have to, to treat people. Please let me know if she would be willing to pass it on to me, if she sees me fit for it. Thanks!! I really enjoyed listening to Mrs. Judy and reading this article. I have searched for a healer for some time bc my 7 year old daughter has suffered with warts for years. I saw the post about Mrs. Judy being ill. So I will begin praying for her to have a full healing herself. She must be a beautiful unselfish women. And I hope things turn around for her. I would like to contact Mrs.Judy for a healing. I would like to get in contact with Mrs Judy. I was treated for warts as a child. My right hand and arm were covered. I was ashamed to be in public. Once treated it only took about three weeks and all of the warts disappeared. I was not raised in a church going family. The power of prayer was shown to me at a young age. I recieved two blessing the day I was treated. My grandfather was a traiteur, he treated for swollen glands but unfortunately the gift died with him because he never passed it on to us. I took all of my children to a traiteur when they were teething and none of them suffered cutting their teeth. Me and my family totally use traiteurs and believe in them. I would love to speak to your mom, I’ve heard that asthma can be treated and I have it really bad, I’ve been hospitalized a number of times! Is there any way possible she would be able to help me? I’ve experienced the truth in what they do. I had a cousin and an aunt ( 1 on each side of family ), to do this. I would like to contact Ms. Judy for healing. I have had had a Chronic Cough along with some other medical issues for 8 years and have been to the Mayo Clinic as well as have several major surgeries to attempt to correct.. How could I get in touch with Judy? I’m from Jennings, LA but live in Houston. I will travel to her if she could see me! How can Ms. Gaspard be contacted? Please send us Ms Gaspard’s phone #. There’s been a lot of cancers in our family lately. We’d even drive to her home for prayers. We live in Houma, La. Thank you. Hi there, Mrs. Judy passed away about one year ago. Best of luck in finding your way back to health. My grandmother was a traiteurs. She past the sun stroke and moon stroke healing to my nephew, my sisters, my mom and to me. She also taught me how to treat for warts and to stop someone from bleeding. I have never used the sun stroke or warts healing but have done the bleeding treatment. My sister and nephew have treated for sun stroke and it works.